The publication of her first book is a dream-come-true for business guru Lynne Copp – literally. And the book – the idea for which came to the author in a dream – scooped Lynne a national award… even before it was published. 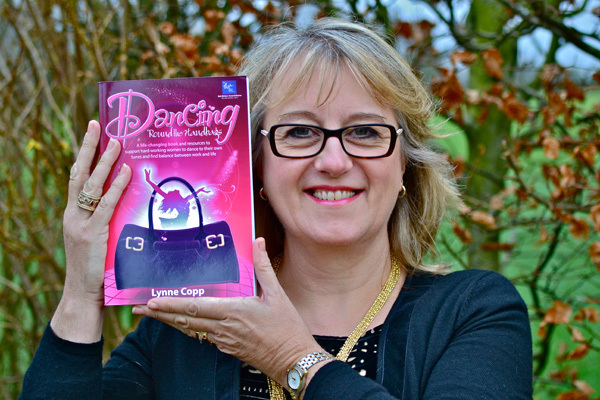 Business self-development guide Dancing ’Round the Handbags was published last Thursday (January 5) and already comes with plaudits attached – it scooped Lynne the coveted title of Best Unpublished Author (non-fiction) at the Brit Writers´ Awards 2011. Lynne´s book was selected from 72,000 entries in the prestigious competition, which was held at London´s Madame Tussauds in London last October. “I was speaking at a conference in Rome, and had to jet back early to attend this fabulous Oscars-style event,” said Lynne, who runs The Worklife Company, providing leadership development training to major corporations including Google, IBM and Hewlett Packard. “When my husband Kevin and I were placed at a table near the back, I gave up hope of getting a prize. But as the winners were revealed, and authors started making their way to the stage from the tables around me, I realised I was still in with a shot. The idea for Dancing ’Round the Handbags came to Lynne – who lives in Burbage, near Marlborough – during a dream back in 1994, while she was working in a management position at Hewlett Packard in Bristol. “I woke up with a ´wow!´ feeling and scribbled ´Dancing Round the Handbags´ on a bedside notepad,” said Lynne. Dancing ’Round the Handbags is about the challenges thrown at working women – juggling work multiple roles like wife, daughter, friend, colleague, employer or mother. Dancing Round the Handbags is a self-development book, series of workshops and one-to-one coaching aimed at hard-working women. Using the metaphor of the ‘handbag’ and the ‘dance’, it supports women to create clarity about personal direction whilst maintaining balance between work and life. The handbag is a metaphor for the career woman, and the items inside the handbag represent different aspects of the businesswoman´s life: the lipstick is the mask worn to put on a brave face; the mirror is the way women see themselves; the purse is the heart of the bag, representing the woman´s right to chose a better job or relationship. Although a work of non-fiction, the book also contains a fictional thread. “As women, we are conditioned from a young age by fairytales to expect a handsome prince to come along and makes things better,” says Lynne. “My fairytale features a businesswoman called Karen who meets a fairy godmother of sorts – her future self. The book promises to remove women from the dance floor of life, where they are dancing to the music of others, open up and explore the handbag that is them, and return them to a new dance floor, where they can dance to their own tune with a de-cluttered, re-packed and renewed handbag. Dancing Round the Handbags is available in paperback or Kindle versions from Amazon, where it peaked at Number 2 in the Assertiveness category of Business Books section. An iBooks version for Apple users is expected through iTunes soon. Meanwhile Lynne will be signing copies in Bath – not at a bookshop but a classy shoes and handbag shop LK Bennett – on Thursday, February 16. And having spent 18 years on her first book, Lynne is cracking on with the second. She has interviewed over 400 women nationally and internationally for a book about ´lipstick leadership´, exploring the ways in which women lead and how businesses need to adapt to accommodate the needs of female employees, who now make up 56 percent of graduate entrants, but who are grossly under-represented in the upper echelons of the business world.